Abundance Wine Country: Vintage, but Still Kicking! I just found a folded, spindled and torn version of a recipe for Mulligatawny soup. The recipe is xeroxed (not copied or scanned) from February 1980 Bon Appetit magazine. I used to make this recipe regularly, and I do remember that it was well-loved by everyone. However, it has long been forgotten in my life. A few days ago, I decided to adapt the recipe to make it healthier and simpler to cook. Afterall, who has time these day to start soup with a whole chicken? 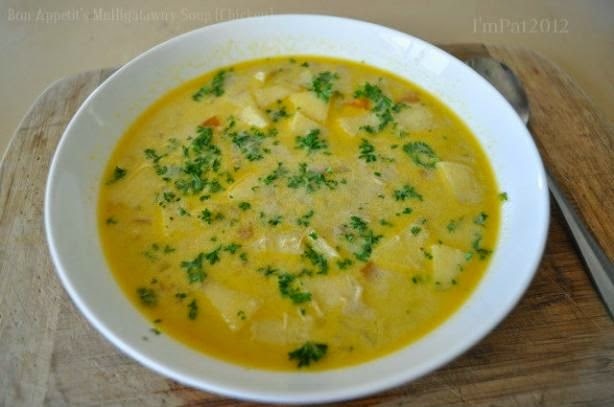 I wanted to create a Tuesday night version of Mulligatawny that was quick, easy and still tasty. And I did. It's here. It even had some of the introductory copy from the original article in Bon Appetit! Anyway, here is the recipe, in case you like to cook classic and want the longer version. It's more effort, but definitely more complexly flavored, too, and worth it if you love to cook. Combine garlic and spices. Melt butter in large skillet over medium-high heat. Add chicken and saute until lightly browned on all sides. Add giblets and saute until cooked through. Transfer chicken and giblets to stockpot. Drain all but 1 tablespoon fat from skillet. Add celery, onion, carrot, leek and spice mixture and blend well. Add a small ladle of stock and cook over low heat, stirring constantly, until vegetables are tender. Add to chicken. Stir in remaining stock and season with salt and pepper. Cover and simmer 30 minutes. Remove chicken with slotted spoon and set aside. Add rice to soup and continue cooking 15 minutes. When chicken is cool enough to handle, cut meat into bite-size pieces, discarding skin and bones. Return chicken to soup and blend in apples and yogurt. Simmer 10 minutes. Degrease soup if necessary. Stir in lemon juice, then blend in cream. Taste and adjust seasoning. Pour into heated tureen and sprinkle with parsley and almonds.